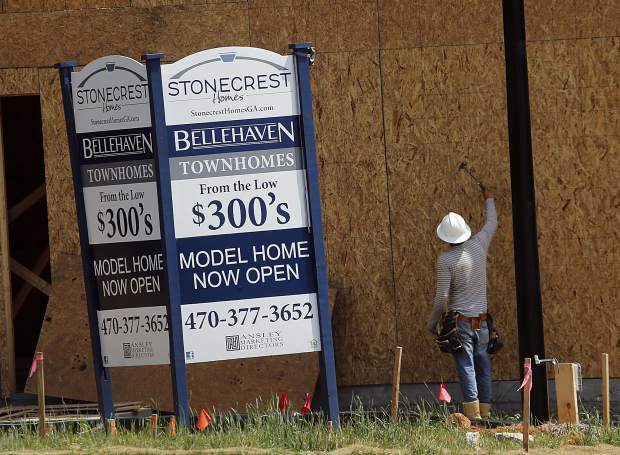 Aconstruction worker continues work on new town homes under construction in Woodstock, Ga.
California home sales dipped slightly in November from a year ago, while the median sales price recorded its highest year-over-year gain since January 2016, according to the California Association of Realtors (CAR). Closed escrow sales of existing, single-family detached homes in California totaled a seasonally adjusted annualized rate of 440,340 units in November, according to information collected by CAR from more than 90 local realtor associations and MLSs statewide. The statewide sales figure represents what would be the total number of homes sold during 2017 if sales maintained the November pace throughout the year. It is adjusted to account for seasonal factors that typically influence home sales. The November sales figure was up 2.1 percent from the 431,080 level in October and down 0.8 percent compared with home sales in November 2016 of a revised 443,960. The annual sales dip is largely attributed to an unseasonally strong sales pace last November. Year-to-date sales are running 1.5 percent ahead of last year’s pace, but the annual sales pace has been declining since first quarter 2017. After reaching its highest level in a decade in August, the statewide median price was essentially flat from October but remained above the $500,000 mark for the ninth straight month. The $546,820 November median price was 0.1 percent higher than October’s $546,430 price but climbed 8.8 percent from the revised $502,490 recorded in November 2016. The year-over-year gain was the highest since January 2016. The median sales price is the point at which half of homes sold for more and half sold for less; it is influenced by the types of homes selling, as well as a general change in values. The Los Angeles Metro and Inland Empire regions recorded year-over-year sales declines of 3.5 percent and 6.2 percent, respectively, while sales in the San Francisco Bay Area inched up 0.7 percent from last year. In the Bay Area, where the region continues to reflect dire market conditions of tight supply and low affordability, sales dropped from October in four of the nine counties in the area. Sales in San Francisco and San Mateo counties grew slightly, while Marin and Napa had very strong gains of 20.6 percent and 22.5 percent, respectively. Additionally, sales in Sonoma County rebounded 25.2 percent from the October wildfires. The four counties that reported monthly sales losses were Alameda, Contra Costa, Santa Clara and Solano counties. The Southern California region had slower sales with every county reporting monthly and annual declines (barring a flat Orange). In the Southland — Los Angeles, San Bernardino and Riverside reported monthly drops of 12.6 percent, 15.9 percent and 9.1 percent, respectively, while San Diego, Orange County and Ventura had declines of 10.4 percent, 4.2 percent and 7.0 percent, respectively. Home prices across the state continued to grow in general in November. Forty-five of the 51 reported counties recorded a year-over-year price increase, with 23 of them growing at double-digit rates. The Bay Area had the strongest price appreciation among all regions with a 12.5-percent regional annual price increase. Statewide active listings continued to decline in November, dropping 11.5 percent from a year ago. Since the beginning of the year, active listings have declined by more than 10 percent every month, and the number of available listings for sale has trended downward for more than two years. The article was contributed by the California Association of Realtors.